To equip all believers to become spiritually mature through the consistent teaching of the Word of God in the pulpit and, by appropriate media technology, usher all unbelievers and reach out to children for them to be saved by faith alone in Christ alone and for spiritual growth and, as royal ambassadors, transform the community for the Glory of God. The Philippines has a population of about 88.57 million. Less than 3-percent are evangelical Christians. By the Grace of God, Grace Christian Church has expanded its coverage but the mission field is vast and there are still millions of souls to be won for Christ and be nurtured for spiritual growth. Nelson T. Rio II isagogically, categorically, and exegetically expounds doctrines in the local dialect in order to increase the perspicacity of the local students of the Word. 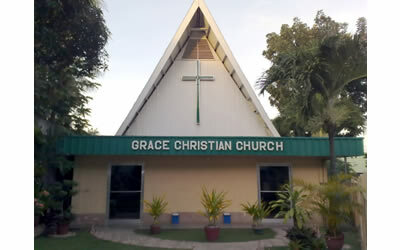 From its geographical location in Central Philippines, the ministry of Grace Christian Church continues so that “all men be saved and come to the knowledge of the truth” (1 Tim. 2:4). Presenting salvation by faith alone in Christ alone (Acts 4:12), and making “the man of God adequate, equipped for every good work” (2 Tim. 3:17) is sustained through the consistent teaching of the Word. The face-to-face Church Bible classes are broadcast over local radio stations in Bohol and Mindanao in the Southern Philippines. Audio and video recordings of the Church Bible classes are also available free of charge. The Church Bible classes can also be heard through the Internet. The radio ministries, development of doctrinal prep-school teaching materials, and the pastor’s support are fully provided for by Operation Grace World Missions (OGWM). Operation and maintenance of the church and its ministries all come from grace giving of doctrinal believers. Perpetuation of indigenous missions through the discovery of the spiritual gift and doctrinal orientation of potential workers and pastor-teachers through consistent post-salvation epistemological rehabilitation; convene regular teaching training seminars to train potential doctrinal teachers and enhance the capability of existing teachers; commissioning of trained doctrinal teachers to handle prep school, and doctrinally oriented pastor-teachers to handle Bible study groups, in Bohol and other locations within the geographical area of operation of the church.